The Church always appears to be at its liveliest when it is gathered around the Holy Father, and the visit of Pope Francis to the United States made that assessment very clear. From the moment he set foot on American soil, the faithful in the United States were invigorated by having the Vicar of Christ on earth close to them, to pray with and for them, and to share the joy of Christ with all people, Catholic and non-Catholic alike. 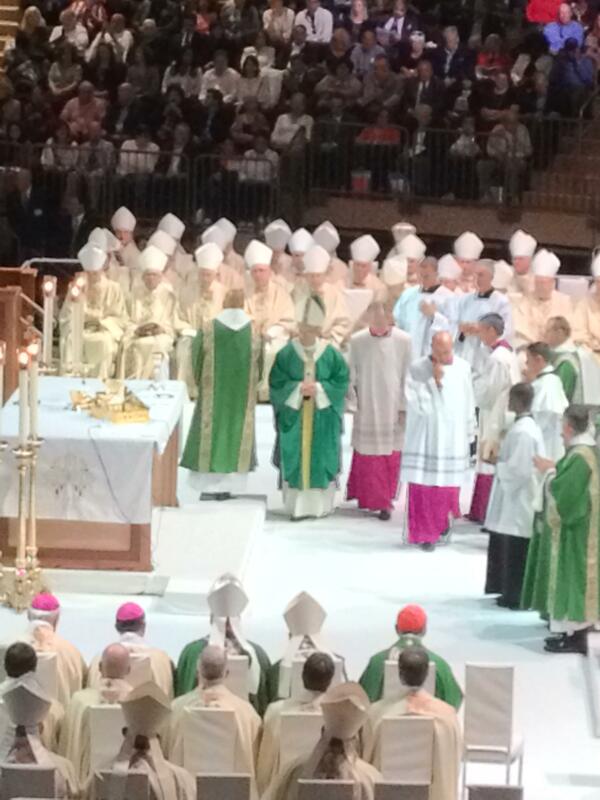 I had the opportunity to see Pope Francis twice: once with the seminarians at Seton Hall in Washington for the canonization of St. Junipero Serra and then again in New York City with the Camden seminarians and a few of the faithful from our diocese at the Papal Mass at Madison Square Garden. It was truly an edifying experience to be in the presence of the Pope, especially during the celebration of the Holy Sacrifice of the Mass. One thing that has stuck with me with my overall experience of the Papal events was the aspect of praying for all of my brothers and sisters, visible and invisible. I remember thinking, during the long wait at the security line in Washington and mingling with men from other seminaries and then seeing the sea of clergy, seminarians and religious at the National Shrine, how all of us, in our different walks of life, are all seeking to follow Christ in the most perfect way: with the vocation He has chosen us to follow. Being with all of the people in Washington, especially with other men around the country who are discerning a vocation to the priesthood, reminded me of how important it is for me to pray for all of us who are members of the Mystical Body of Christ. All of these thoughts came to full circle during the Papal Mass in New York when Pope Francis, after the dismissal, requested all gathered in the arena to “…please, don’t forget to pray for me,” which led to a deafening, but joyful and electric round of applause. 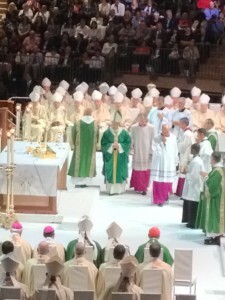 As I looked at Pope Francis, at Bishop Sullivan who was concelebrating, and at the other bishops and priests, I could not help but to think that no matter who we are in the Church, whether it is the Pope, a seminarian, a member of the congregation, a homebound person who has Christ in the Eucharist brought to them, or a persecuted Christian who is willing to risk their life to go to Mass just once, we need to pray for each other because prayer is what unites us to Christ, which in turn, unites us with each member of the Church. Let us continue to pray for Pope Francis that God will continue to strengthen him in his ministry. Please continue to pray for more vocations for the Diocese of Camden. And please, don’t forget to pray for each other! Carlo Santa Teresa is on Pastoral Year serving at Saint Andrew the Apostle, Gibbsboro.